The book unfolds a bit like a mystery. There are many variables that slowly come together as characters gain new understanding and insight into the puzzle that surrounds the infant Lyra and Dust. While Lyra is integral, and you find out how she came to be a ward of Jordan College, primarily this is the story of Malcom Polstead. A curious and intelligent boy of eleven, who’s daemon, Asta, has yet to settle. His family owns an inn that is at a bend in the river Thames and is not far from Oxford and the colleges that reside there. Many scholars come to the inn and Malcolm at an early age was an eager listener and learner. Across the river is the Priory of Godstow where nuns go about their holy business. Malcolm is a good friend of the nuns and often helps with odd jobs. But when left to his own devices he loves nothing more than to spend time with his cherished canoe, La Belle Sauvage. Malcolm’s world begins to shift when he becomes entangled with a spy and a group of mysterious individuals come to the Inn one night asking questions about the nuns in the priory. 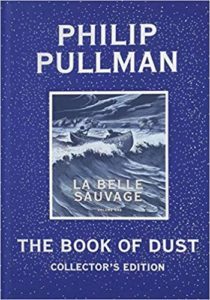 Philip Pullman does an excellent job writing children and exploring the boundary between childhood and adolescence. If you liked “His Dark Materials” trilogy I strongly suspect you’ll like this book too. I was engaged and curious at every turn, eager to find out the next layer of what was happening. This isn’t just back story for Lyra, it is also gives greater understanding of the world politics that led to events in The Golden Compass and of Dust itself. Share the post "A boy, his canoe, and the beginning"